There is really no way we can know the heart, the intentions, or the circumstances of someone who might say or do something we find reason to criticize. Thus the commandment: 'judge not.'" 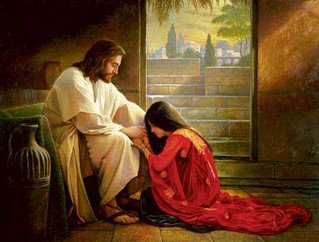 I love that forgiveness is a reality, that the malice in my heart has been replaced by the pure love of Jesus Christ. No need to worry about fair, right or wrong, who's to blame or not. Just a release and a let go of natural man chains. I've been living. Last night I came home dead tired and instead of facebooking I asked T to play a game with me. He graciously agreed. It was looking like a continual loss of Five Crowns for me (thank you, Lacey for the new cards :). But in the 13th round, when the Kings went wild (please tell me you know this wonderful game)--I triumped! My life is full of abundance. I have ears to hear and eyes to see the blessings and miracles of living today! Resolutions. Some people (like T) LIVE for them. I have always felt a little grumpy (ha! see last post) about goals. I tend to feel discouraged before I even start the battle. But would you look at this face of the girl below? Man, she looks happy! And stress-free, just riding Marissa's (9 yr-old sister in law) new bike around farm land Benjamin. Maybe it was a self-fulfilling prophecy, but I just knew I'd be crabby after coming home from a 2 and a half week vacation to Utah. Don't get me wrong, there were plenty of up and downs on that trip, but the feeling of being disconnected to real life was quite cozy, charming, whatever you want to call it. It was fantastic. And now I am sitting at my computer, supposedly writing my thesis (first draft due in less than a week). And our house is cold. We've tried some new plastic stuff for over the windows (the guy at Fred Meyer's was able to convince me out of a space heater to Tyler's relief :), so maybe that will help. I'm in my pink bathrobe with a sweater and jeans. being resolved to set and keep some goals. 2) Really live. Have spontaneous adventures at least 2x a month. Smile more. Learn some funny jokes and execute them. Encourage others rather than compare myself to them. 3) Keep up the exercise and food routine. You know how they say diets don't work? It's true, because a diet means you're going to kill yourself for a while and then go back to your old ways. Well, in 2010, I started changing the way I live. I was on a live it (is there a life or death theme going on here?). When I stepped on a scale for the first time in months, I realize I've gradually lost 20 lbs over the space of a year. That was some slow, almost unnoticeable change, but it was just from eating healthier and jogging several times a week. B) Stop "stuffing" as Tyler calls it--I can't stand looking at clutter, so I'll stuff things in drawers instead of walking upstairs, etc. No more. If I can't put it were it belongs, it will stay out of place. C) Tyler got me a nuvi GPS for the car--I will keep the front seat cleaned out so we can feel like we have one of those ritzy cars with our ritzy GPS. D) Keep my school papers cleaned up instead of stacked next to the computer. Enough said. 5) Give my burdens to the Lord more freely. Now I know this one isn't a S.M.A.R.T. goal, that it will be hard to measure, but I have a worrying problem, and it's a favorite thing that I need to let go of. When I'm weighed down, I have a choice. I can give it to the dear Redeemer--He's so willing and oh so able. 6) Take trips. Even small ones. 8) Teach voice students (I have 4 now). 9) Become a mother. I feel like I already am one in some ways, but I want to hone in on those sensitivities, desires, nurturing qualities, regardless of whether I get pregnant this year or not (which I've already figured out is pretty much OUT of my resolved control). 10) Be a better blogger. Happy new year. I have clients out my ears, a thesis that keeps calling me, a husband who sacrifices for my good, a family that means the world to me, and friends who care. I am blessed and my cup will continue to run over so long as I keep counting blessings.